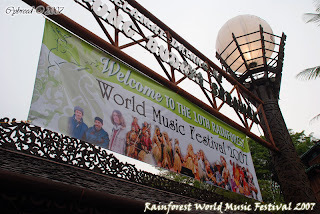 2007 is the 10th year the Rainforest World Music Festival has been organized by the Sarawak Tourism Board (STB). And for the past 9 times. I have never been there. Every time I told myself I would go, but every time something came up or it just didn't happen. Everyone of my friends were either reluctant or just plain lazy. Or just decided right at the very last hour to go or not to go. This year Nick confirmed the trip therefore I also confirmed my trip. We had a room there. So we didn't have to commute back down to town when the event finished at 1.30AM. Anyways were suppose to go up at around 11 or so. But many things came up, and we finally made our way to Damai at around 12.30PM (I think, I was not wearing a watch). 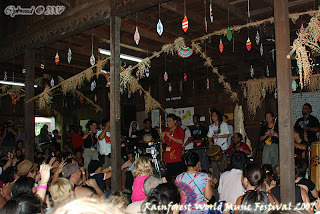 Checked into the room yak yak a bit and headed off into the Sarawak Cultural Village where the Rainforest World Music Festival was held. This was taken from the main entrance. 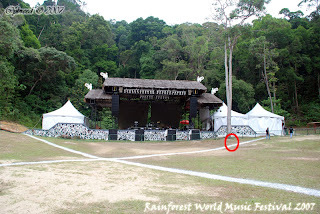 The red circle represents our location for the night. Awesome! In the thick of everything. The sound system were awesome, the lights system where awesome and video system were awesome! LoL! how many times have I said awesome? Bwahahaha! 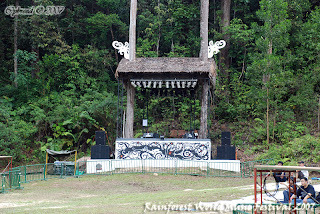 So here is the secondary stage where after each performance the crowds attention was turned to the Secondary Stage so the main stage could be cleared and set up for the next performance. Awesome! This was one of the many workshops around SCV. The drums were always good and moves people a lot. Even tho the crowd was very diverse. Some instruments were very foreign, but beats apparently know no boundary. No matter where you hail from, when the beat comes you move with the beat, always. This group of performers where on percussions only. And manage to get the crowd going. 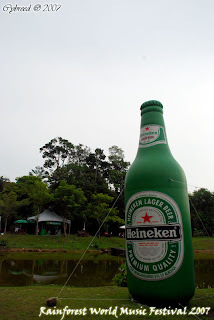 This was shot at a Rumah Panjang (Long House). All over SCV there were mini workshops being performed simultaneously. If I'm not mistaken they were from East Coast in West Malaysia. Awesome! After about 5pm we left the event back to our room and prepared for dinner at Buntal. There are heaps of seafood restaurants over there. After dinner it was already 8pm plus. Judy was waiting for her ticket (she asked me to buy one extra for her and I was holding it, she was at the entrance waiting for over one hour and half, SORRY!). Her photos are HERE. Well after getting in, went to our location as indicated in the 2nd picture above and had a blast. The music was awesome. No matter what LIVE bands are always the best. Better than any electronica or anything like that. The last band Huun Huur Tu & Malerija was awesome. Both were from Russia, Huun Huur Tu near the Mongolian border with their traditional instruments and Malerija from I have no idea where in Russia with their electronic guitars and bass and electronic sounds.. both together you get a fusion of great music and great time. Extremely impressive. You get traditional sounds then suddenly the electronica and metal sounds come in, and yet able to compliment each other. Awesome!!! I was there for 1 day of 3. 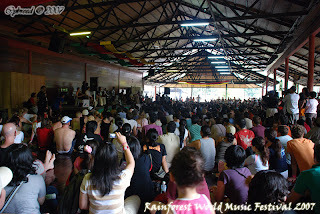 I cannot imagine those who went for 3 days of workshop and party all 3 nights. My gosh, you guys are really legends. Seriously an intense cultural experience. 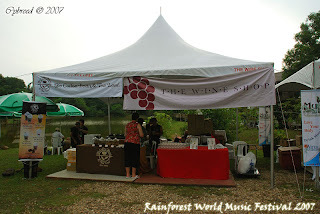 Well thats the end of my "writeup" on RWMF 2007. 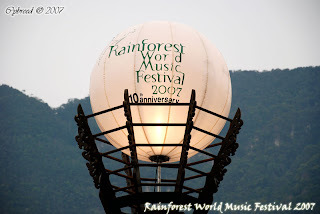 I hope to be there again next year~ I hope to see YOU there next year~! I didn't bring my camera at night, cos it was bulky and I wanted to party XD awesome! http://cybreed.multiply.com/links/item/72 - extracted from The Star Online.